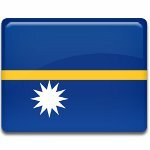 On January 31, Nauru celebrates its Independence Day. The country became the world's smallest independent republic on January 31, 1968. The Republic of Nauru is a small island country in Micronesia in the Pacific Ocean. The island was first settled by Polynesian and Micronesian clans approximately three thousand years ago. The first Europeans to set foot on the island were the crew of the British ship Hunter led by captain John Fearn. They encountered Nauru in 1798. In 1888, the island was annexed by Germany and incorporated into New Guinea Protectorate. The German rule lasted for almost thirty years. At the time Nauru was inhabited by twelve tribes which are now represented by the twelve-pointed star in the state flag. During World War I, the island was captured by the Australian force. In 1923, Australia was given a trustee mandate over Nauru. During World War II, the island was occupied by Japanese troops. In 1945, the Japanese surrendered Nauru to the Australian military. In 1947, the UN established a trusteeship over the island. The trustees of Nauru were Australia, New Zealand and the UK, with Australia being the main trustee. In 1966, Nauru became self-governing, and on January 31, 1968 its independence was declared.